GRAND JUNCTION, Co. — A Colorado man hailed Satan as he presented an invocation at a city council meeting this week, while some concerned members of the community stood outside praying. 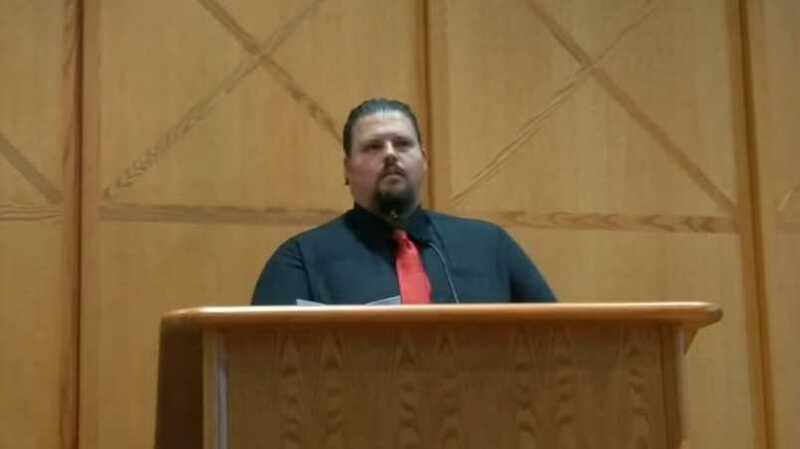 During Wednesday’s meeting before the Grand Junction City Council, Mayor Rick Taggart called out Scott Iles, a member of the Western Colorado Atheists and Freethinkers, who had been randomly selected to lead the invocation that day. Iles rather introduced his friend Andrew Vodopich, who he said was a “much better public speaker” and would therefore be offering his words instead. Vodopich, wearing a black shirt, red tie and what the Daily Sentinel described as a “serpent beard ring,” read expressionless from a prepared statement. “We beseech all those present to shun primitive hatreds and superstition, bigotry, prejudice and atavism, and instead seek equality in justice and thereby safeguard all worldviews and treat them equally and with respect,” he said. “We counsel this entire community to allow the light of truth to shine unobstructed on all matters, and to let not one coveted assumption be spared examination, to let not one archaic belief be spared disgrace, and thus leave no room for ignorance and assumption,” Vodopich stated. “Hail, Satan,” Vodopich said before departing the podium, being joined in his proclamation by a woman recording him. While Vodopich was hailing Satan inside of city hall, and estimated 25 people stood in a circle outside of the building, where they prayed the Lord’s Prayer. Some also offered independent prayers and one man took a prayer walk around the block. Participant Kevin McCarney said that he believed there should have been more than 10 times as many people present. As previously reported, last July, David Suhor of the Satanic Temple—an organization that says it does not believe in Satan but views him as a metaphor for rebellion—wore a hooded robe as he delivered an invocation at a city council meeting in Pensacola, Florida. Suhor acknowledged during the same meeting that he had a reason for the spectacle. “Adopt some [expletive] rules. Stop pandering for votes. Quit pushing Christian privilege as we’ve seen with the Bayview cross and so many other issues and instead go to a moment of silence, that lets everybody pray or not according to their own conscience,” he said.